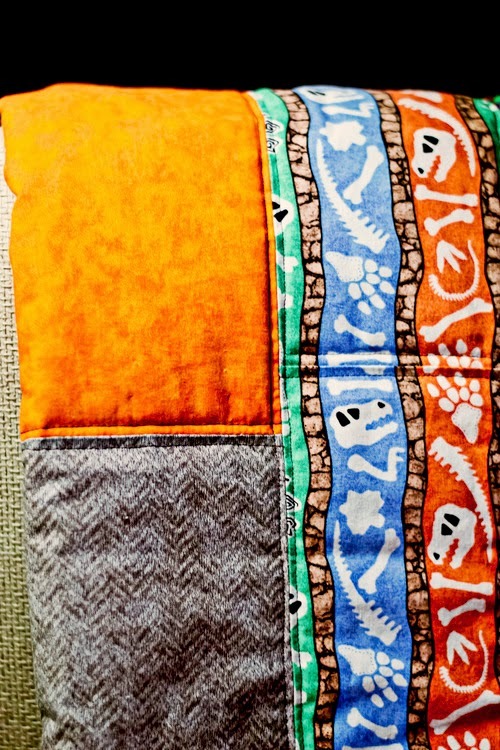 Since I learned to quilt it has become my go to gift for babies. I’m not sure why, considering they’re not cheaper than the average gift and it certainly takes more time. But I love making them! Taking the time to pick a pattern, find material, cut, arrange sew, pin and then finally seeing your end result, it was a wonderful accomplishment! 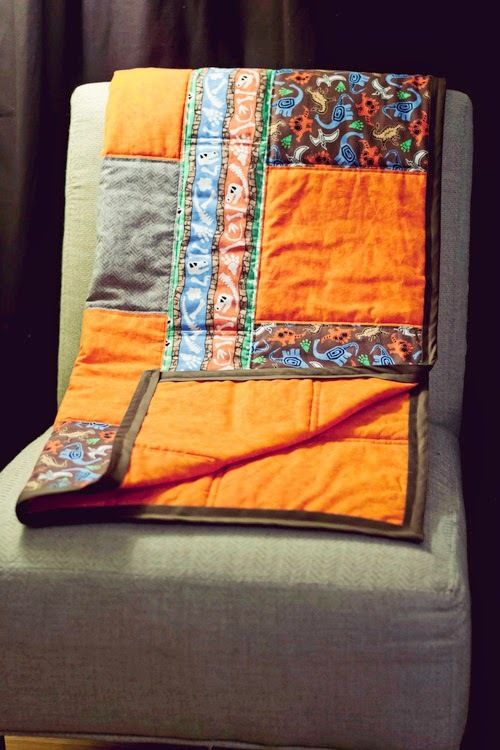 I made two baby quilts during the month of March, this is quilt number two. 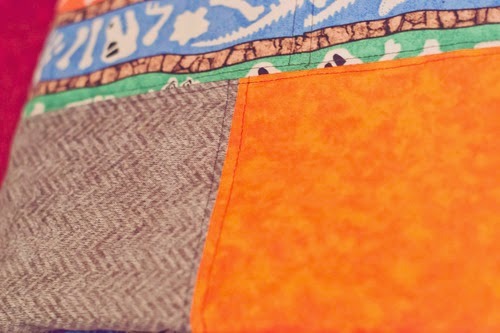 Why am I showing you quilt number two first? Because number one is STILL hanging in my closet, finished but never mailed. How awesome is that? There is a cold baby in Texas waiting for her quilt. Okay, she’s probably not cold, I assume other people gave her blankets… but she’s being deprived of the beauty I slaved over and had to take apart to fix. But that’s another story. Today, we get to see Dinosaur Bones made specially for a special little boy who has not made it to the world yet and better stay put at least two more weeks. You hear me little guy? Stop giving your momma contractions and stay where it is warm! It’s spring in Oklahoma, naturally, that means it is 30 degrees outside, stay put. When I told his Momma I wanted to make a quilt, I let her put in a color request. 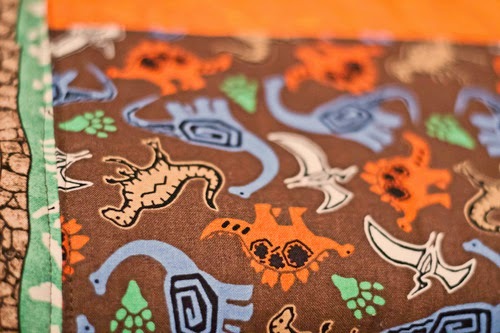 I then took a trip to the fabric getting place and compiled a bunch of photos of “possibilities.” One of these possibilities was Dinosaur Bones, as soon as I found it, I knew I wanted to make something with it. I also knew that the Momma in question will occasionally send me dinosaur memes because we both get a kick out of them. And my dreams came true when I got the text claiming Dinosaurs as THE ONE. I rushed back to the fabric store and made my purchase. 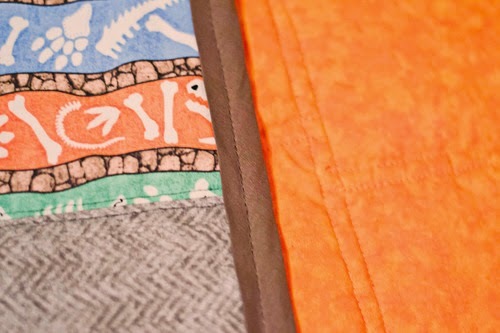 At this time I was still working on quilt number one and didn’t actually think I would have time to work on Dinosaurs in the month of March. But I ended up finishing the other and with SIX days to baby shower, I began cutting. I have been daring myself to touch more difficult patterns, things that test my patience and sanity but overall come out beautiful. Totally worth the literal blood and tears. But with six days, I was pushing it. As I looked over the print for the quilt, I knew it would be better suited with a simple pattern that displayed the fabric print. 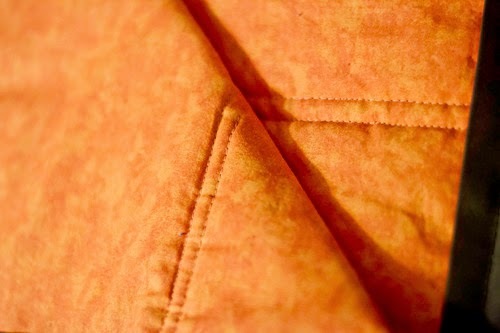 Everything went smooth from cutting to piecing and sewing. 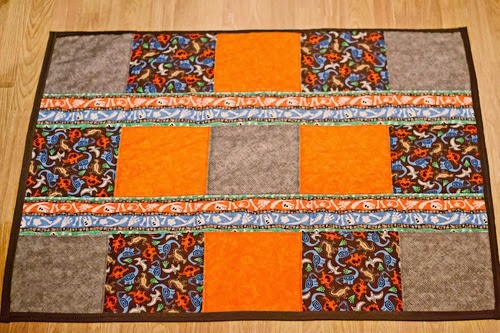 I got it all laid out and began pinning, but after pinning the entire quilt I met my first obstacle. 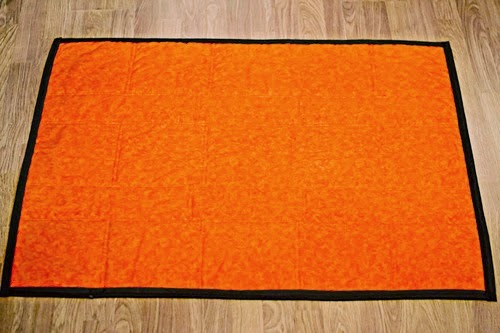 This beautiful orange fabric I chose as my backing was actually made in hell and sent to this earth to torture me. It slipped and in between my pins I had way too much material. I had to unpin the entire thing and work it in sections! It was awesome, really… no really, I had some chocolate and fries, found comfort and moved on. 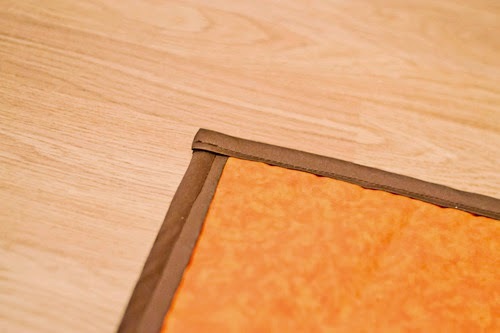 And then I got all the way to my binding to realize I purchased single fold bias tape instead of double, I went with it anyway and hated it, HATED IT. So the next day I ran back to the getting place, purchased the double fold and finished that puppy. WHEW! Clipped it, photographed it and wrapped it for the shower the following day. I’m just going to take a moment to pat myself on the back. 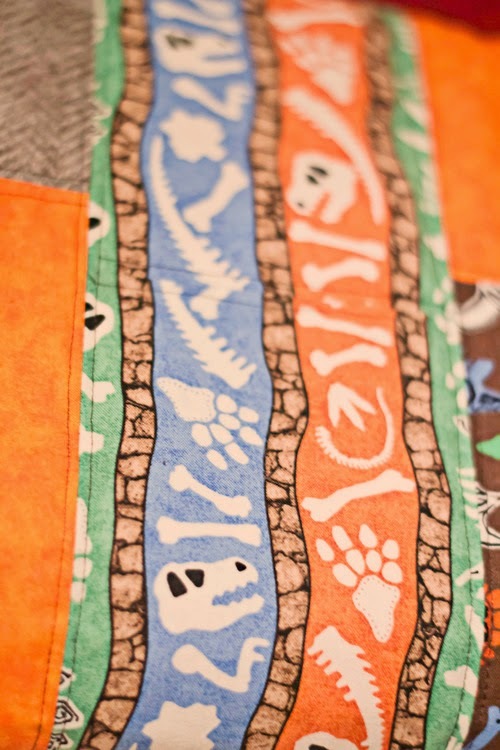 Now, you’ve read my heart wrenching story of blood, thread and dinosaurs; I bet you’d like to see the quilt? But, of course. I used a thick and fluffy batting for this one and I love it. 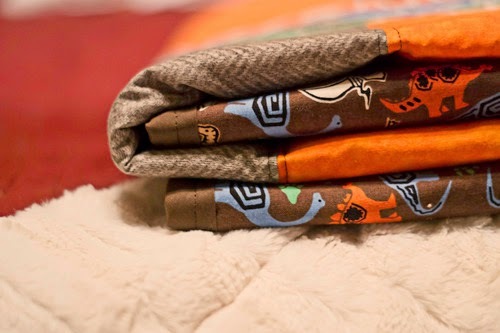 If I still had it, I’d sit around and hug this quilt. I am so happy with how this one came out, it’s just what I wanted to make. I hope baby boy loves it just as much as I do.